Sammy, a clever pet mouse, lives a contented life until his owner’s brother kidnaps him to serve as pilot for a remote-controlled plane. Then his adventures begin. 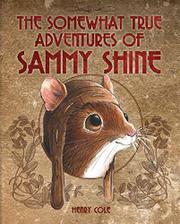 The plane gets away from the boy and crashes into distant woods, where Sammy encounters a community of mice, including a helpful young female, Phoebe. After his damaged plane—his only means to get back home—goes missing, he sets out to find Goggles, a raccoon rumored to have great ideas but who can only be reached after a long journey. Along the way, Sammy’s joined by a crow that can’t fly, a newt, a shrew, and finally, Phoebe. Their quest is threatened by an evil weasel and his wily band of rats. Characters are only thinly developed, and the story is just mildly suspenseful. It is so brief (despite page count) the potential dangers simply don’t get expanded upon enough to feel truly threatening. But the illustrations lift this effort above the pack. Cole’s soft, delicately shaded black-and-white artwork appears on nearly every spread, with numerous double-page spreads. The realistic woodland scenes populated with slightly anthropomorphized creatures beg for closer study.